Children often enjoy putting on a puppet shows, which can be performed using an imaginary story or taken from a classic story, such as Pinocchio. Instead of buying a generic Pinocchio puppet from a toy store, you can make a handmade Pinocchio puppet using materials that can be purchased from an arts and crafts store. 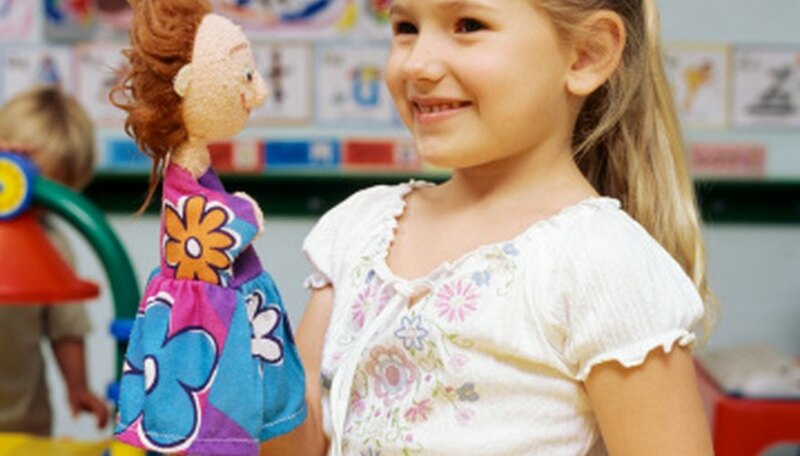 Once finished, you can give the puppet to your child so that she can re-enact a play starring Pinocchio. Place two sheet of felt fabric together, each measuring 12 inches long, 8 inches wide. Place your hand on top of the felt and trace around it with a pencil. Span out your thumb and pinkie and leave your three middle finger pressed together. The thumb and pinkie will become the puppet's arms. Leave a 1-inch seam allowance around the tracing. Cut out the traced shape from both sheets of the felt. Lay one of the forms onto a table top and squeeze a line of craft glue around the inside edge. Do not glue the wrist area of the puppet. Lay the second form on top of the first, lining up the edges. Press the edges to adhere the two forms together. This will complete the basic puppet form. Allow the form to dry. Cut out an oval that measures 1/2-inch wide, 3 inches long. This will be Pinocchio's nose. Glue the nose onto the puppet form, placing it so that it sticks out horizontally from the center. Let the piece dry in place. Glue two googly eyes above Pinocchio's nose. Glue two buttons onto the middle of either arm piece, which will symbolize Pinocchio's puppet elbows. Draw on detailing using paint pens.